In the Philippines, Lenguas De Gato which are usually packed in a clear plastic jar with yellow lid, are a favorite “pasalubong” (homecoming gift), and you can find them in bus terminals, roadside pasalubong stalls and now, even in the mall and grocery stores. I haven't had these treats for years, so when I saw a recipe for Lengua De Gato in my new Goldilocks Bakebook, I was so anxious to try it! I immediately made two batches, one with the regular butter flavor...and the other one, with a hint of chocolate. They're really easy to make. The only thing I found difficulty with is making them into equal size cat's tongues. :) I also noticed that the plain butter ones didn't turn out as yellowish as they're supposed to be. I even added one egg yolk to the recipe, but they still turned out pale. But they are delicious and close enough to the Lengua De Gato I've always loved. Try it yourself...I'm sure that like me, you will love their melt-in-your-mouth goodness! Wishing you all a HAPPY VALENTINE"S DAY! 1. Preheat oven to 350F. Line two cookie sheets with parchment paper. 2. Using a mixer on medium speed, cream butter and 1/2 cup sugar in a bowl for 2 minutes. Add vanilla extract and egg yolk. Mix until well combined. 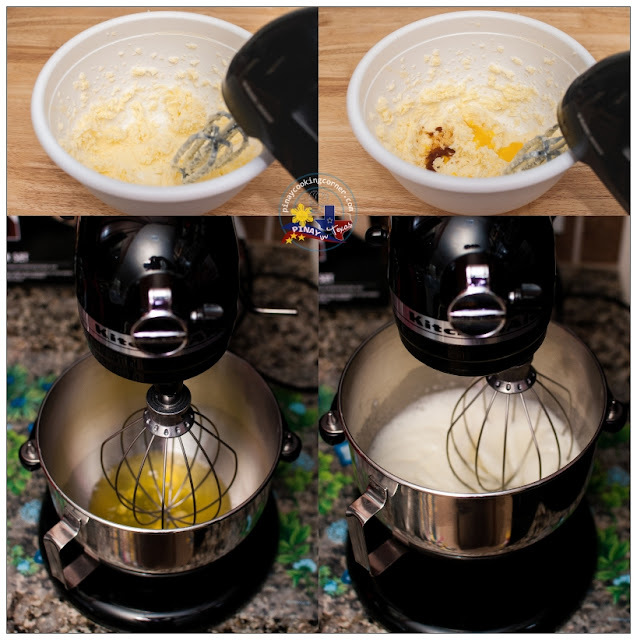 Switch mixer to low speed and gradually add cake flour. Keep on mixing until all ingredients are well incorporated. In another bowl, beat egg whites on medium speed until soft peaks form. 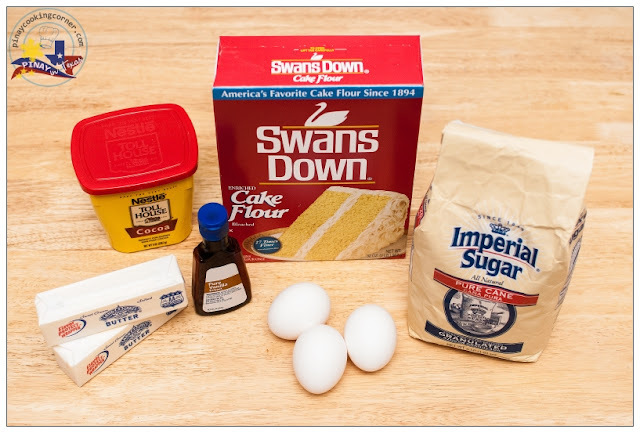 Gradually add 1/3 cup sugar and beat on high speed until stiff peaks form. 3. 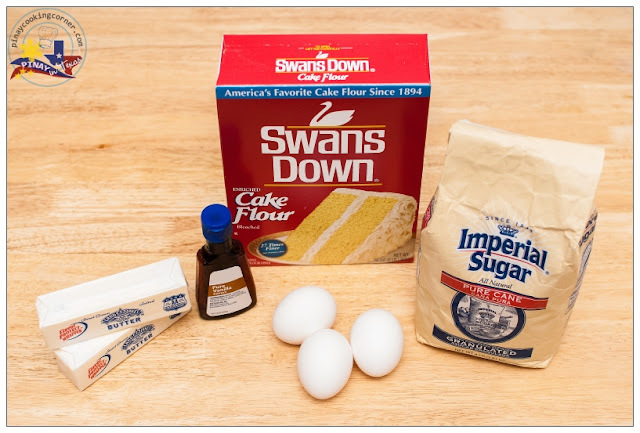 Add egg white mixture into batter and mix on low speed until combined. Put batter in a piping bag with 1/4-inch round tip. 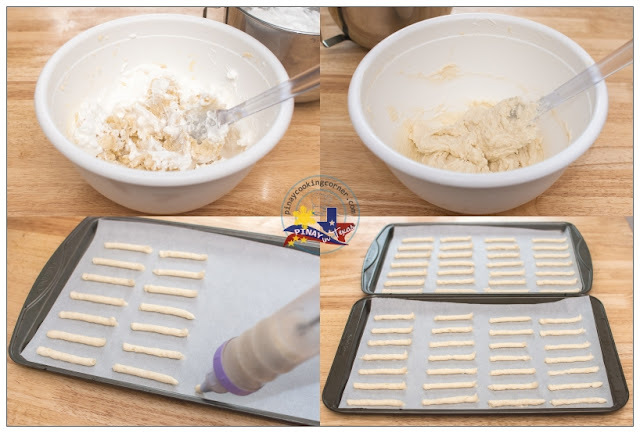 Pipe batter into 2-1/2 inch long pencil thin strips on the prepared cookie sheets, at least one inch apart. Bake for 8-10 minutes or until the edges are lightly browned. (Be sure to watch them because they can easily burn.) Immediately remove from the pan and transfer to wire racks to cool down. 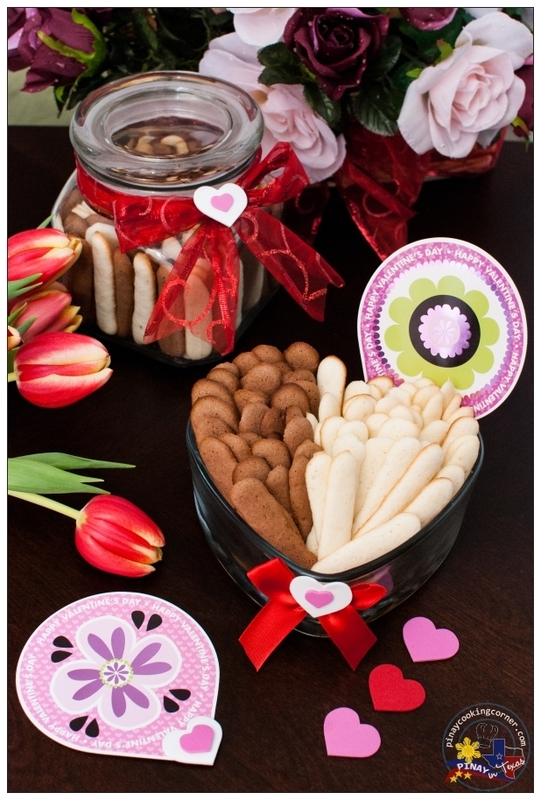 Store in a cookie jar or any airtight container. Really easy and such shape looks so nice! These cookies look delicious...light and so simple to make. These are so beautifully made! Love the presentation! Happy Valentine's Day to u, dear! Happy Valentine's Tina! Beautiful cookies! Are these lady fingers or something different? 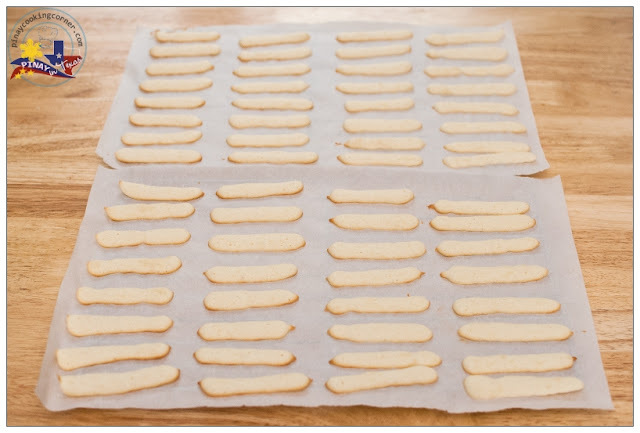 The shape of lengua de gato is similar to lady fingers but they're a lot smaller and the texture is different. As usual, I admire your baking skills and this is another one to add to the list. Looks lovely and sweets are the best opening for Valentine's day. 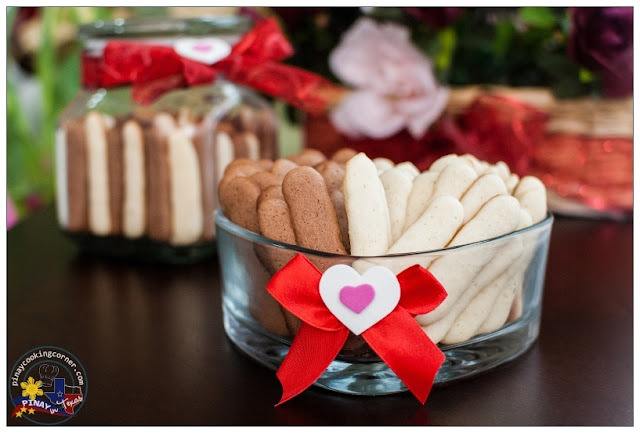 They are beautiful Tina, Love that shape may be I can use in Tiramasu.Happy Valentine's day. Hi Tina, happy valentine's day to you. Very cute and pretty cookies. Beautiful packaging, perfect gift for valentine. These cookies are so cute. Yes, they do look like cat's tongues. I gotta give theses a try, Valentine's day or not! :P My family has a sweet tooth that they can eat sweet treat any day. I love that these cookies are the "melt in your mouth" type. Must be lovely. Hope you had a wonderful Valentine's Day celebration. I love the packaging , perfect gift not only for V Day !